Made with correct type 4 1/2" wool webbing. 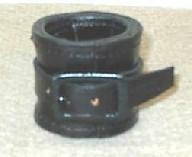 Features black roller buckles and D-ring. My standard length is approx. 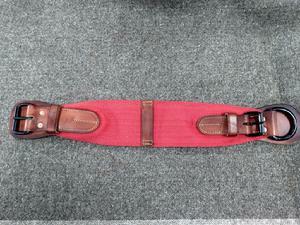 26" from outside of D-ring to outside of roller buckle. I can make it longer or shorter if you need a different length. Made with 3 1/2" blue wool webbing. Features large stamped brass heart with tie down ring. Buckle Options: Black roller buckles, brass or black horseshoe buckles available. 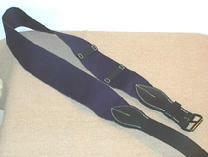 All of my breast straps are available with or without snap on the piece that connects to the girth. 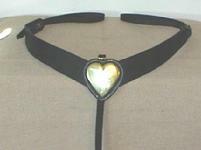 Features small eagle brass heart with brass buckles and fancy stitching. Black or brass buckles. Sold in pairs. Includes toe strap. Sold by the pair. Wooden Frames only. Sold by the pair. Includes front, rear, off side, near side straps. Sewn onto spaded D rings. Includes saddlebag stud and rivets. Black or brass bar buckles, horseshoe, or roller buckles available. Standard US issue. These are made with welting just like the originals. Two pockets per bag. Civil War bar frame buckles. Please note I only cut the footman loop slots if they are going on one of my saddles. Other saddles may be different. If you want me to cut the slots, you need to send me a template. 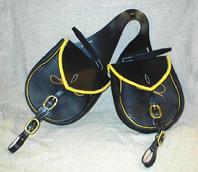 Features yellow leather binding on flaps, yellow welting, and brass buckles. Popular style of the 1860's. Available in black or russet. Russet shades will vary. 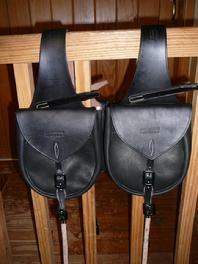 These are designed to fit a McClellan saddle. I can also make them for Hopes or A-Forks, please specify! 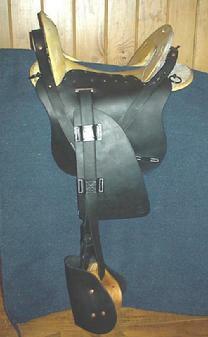 Heavy leather molded into hourglass shape with correct Civil War bar buckle attached to strap. Indian War, early model without the brass throat. Made to fit 45/70 Springfield Carbine. 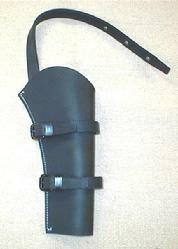 These are two Civil War flap holsters with a connecting strap. 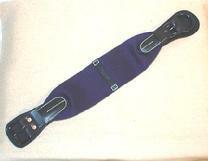 Buckle straps to attach to breast strap. Carried with pistol butts forward. Will fit 51 Navy, 60 Army, 58 Remington and 73 SAA. Stainless Steel. Complete with cork, brass ring and chain. 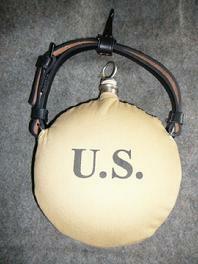 Mounted strap with snap included. These have a rectangular strap hanger whereas the originals had a triangular hanger. I have a limited number of unissued original snaps. 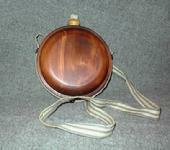 Handmade wooden cedar canteen. Features cotton web strap and beeswax lining. Hand turned wooden spout with cork.